Calculates the beats per minute (BPM) from taps on the touchscreen. Useful for finding the tempo of a song or your heart rate. Controls GoldWave remotely through a mobile device. A licensed version of GoldWave v6.16 or later is required. 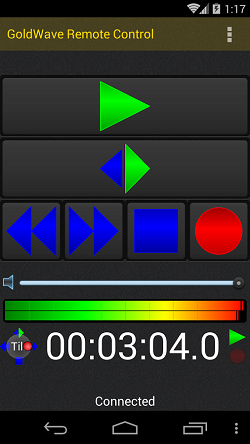 Controls include Play, Rewind, Fast Forward, Skip Back, Stop, Record, and Volume. Realtime meters show the current level of playback or recording. A "Tilt" option controls playback simply by tilting the device. For transcription work, start, skip back, stop, and resume playback when typing without having to switch between GoldWave and another program. For musicians, start recording away from your computer in a studio or on set. A recent device is required (ARMv7 CPU with NEON). 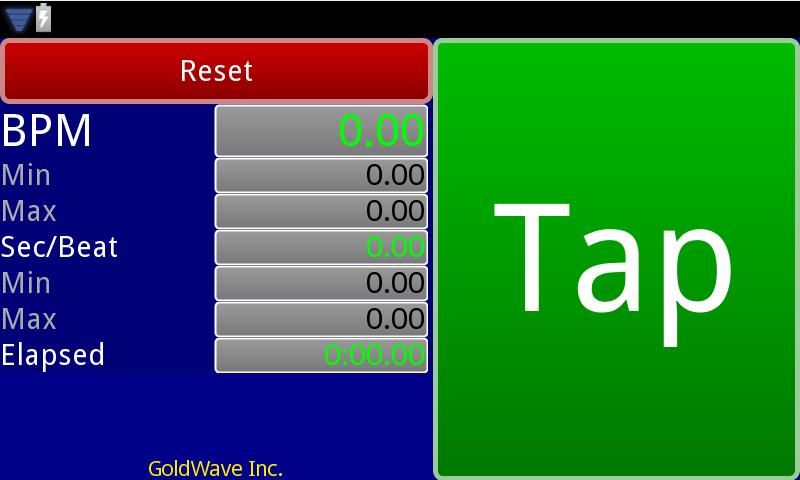 A licensed version of GoldWave v6.16 or later is required. The device must be connected to the same local area network as the computer running GoldWave. GoldWave must be able to connect to the device through the Windows firewall.